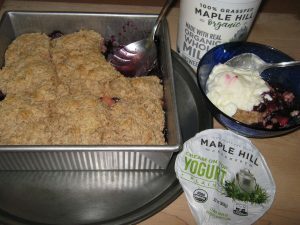 A few weeks ago, in a Here to Help column appearing in the New York Times, Molly O’Neill shared a recipe for Chez Panisse’s Blueberry Cobbler. O’Neill noted that the recipe prizes the berries above all, using only 1/3 cup of sugar. A blueberry cobbler from the kitchens of Chez Panisse, the mother of all farm to table restaurants opened by food activist Alice Waters in 1971, is an irresistible dessert in mid July when local blueberries are becoming available. 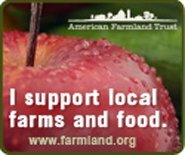 The Wikipedia page on the Berkeley, CA Chez Panisse sums up the importance of this restaurant which focuses on ingredients rather than technique and has developed a supply network of direct relationships with local farmers, ranchers and dairies. 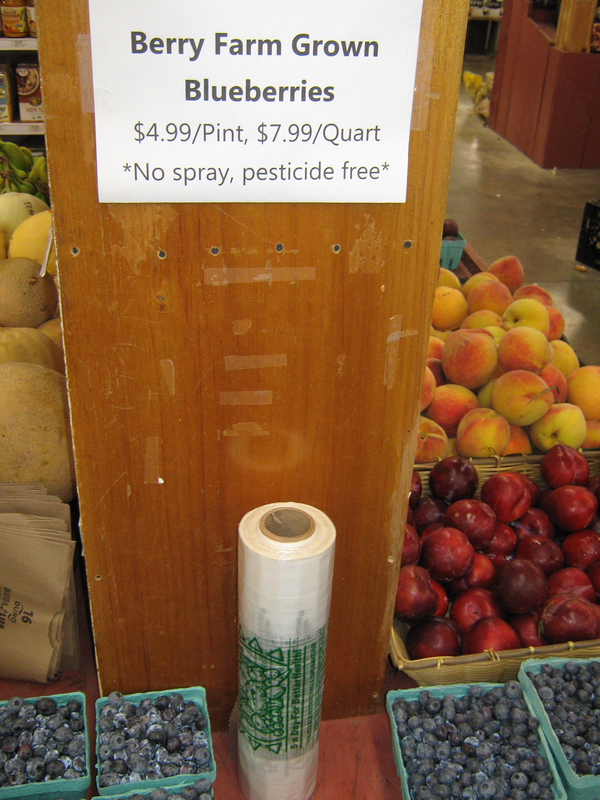 Although conventional blueberries do not appear on the Environmental Working Group’s list of the dirty dozen, on the group’s full list blueberries are shown as number 15. 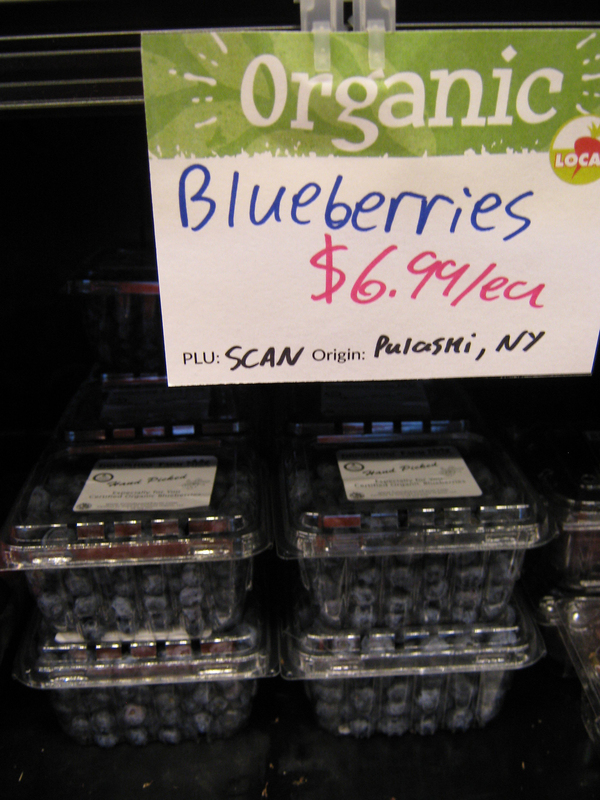 No surprise then, that for our blueberry rhubarb cobbler, local and organic blueberries would be the main ingredient in preparing our summertime dessert. 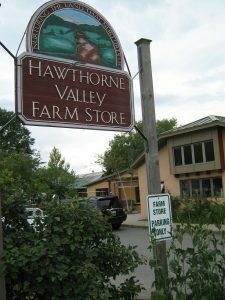 Last summer, we shared a recipe for Oatmeal Strawberry Squares from Beatrice Trum Hunter’s trail-blazing The Natural Foods Cookbook from 1961 and noted the difficult quest to find local and organic strawberries. 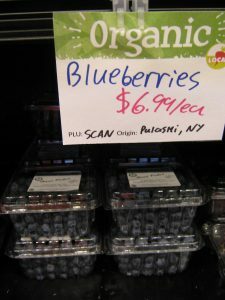 Our hunt for local and organic blueberries took less effort since we could retrace our path from last summer’s hunt for strawberries. 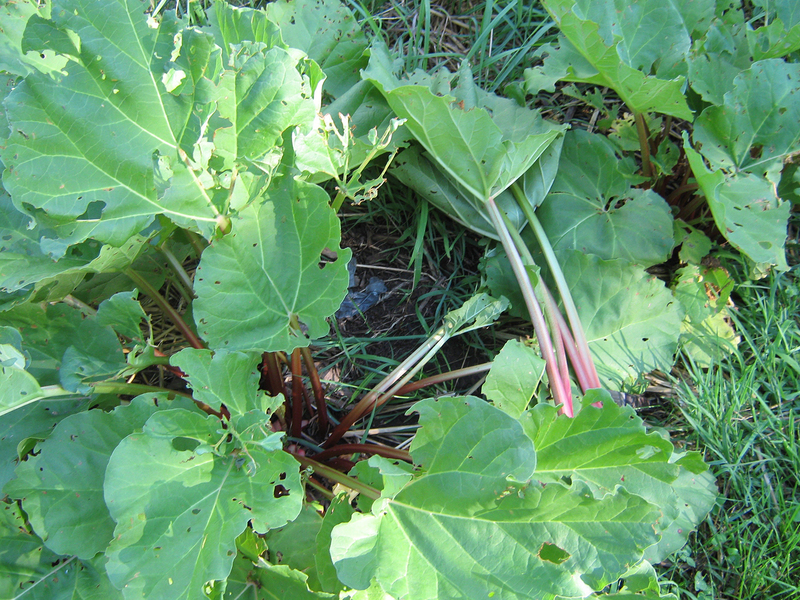 And much easier, was harvesting some stalks of rhubarb from a backyard garden to use in our variation on the Chez Panisse recipe. In addition to substituting a cup of rhubarb (to accent the sweet with a complementary tart flavor) for one cup of fresh blueberries in the original Chez Panisse recipe, instead of using 3/4 cup of heavy cream, our recipe substitutes 3/4 cup of kefir milk. Another variation, since our recipe uses a cup of sliced-up rhubarb, a slightly longer baking time of 40 to 45 minutes is needed to ensure that the rhubarb becomes tender, instead of 35 to 40 minutes if only blueberries are used. This local and organic food advocate almost always avoids using added sugar, and although tempted to substitute local maple syrup or local honey, for this recipe I broke my rule and used Jedwards Fair Trade Certified Organic sugar, available in the bulk food section of my hometown food co-op, the Honest Weight in Albany, NY. 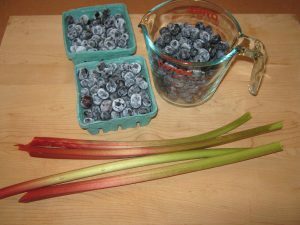 To prepare the blueberries and rhubarb, place in a bowl the blueberries and sliced-up rhubarb and toss with the sugar and flour. Set aside. To make the dough, mix the flour, salt, sugar and baking powder in a bowl. [I used all-purpose, organic whole wheat flour from Farmer Ground Flour in Trumansburg (Tompkins County, NY).] Cut in the butter until mixture resembles coarse meal. [I used Kriemhild Meadow butter made with milk from the Hamilton (Madison County, NY) dairy farm’s grass-fed cows.] Add the kefir milk and mix lightly, just until the dry ingredients are moistened. Put the blueberries and rhubarb in a 1 1/2-quart baking dish or pan. Make patties out of the dough, 2 to 2 1/2 inches in diameter and 1/2 inch thick. Arrange them over the top of the berries and rhubarb. Bake until the topping is brown and the juices bubble thickly around it, about 40 to 45 minutes. Serve warm, with yogurt or cream or vanilla ice-cream, if desired.